NEW YORK, NY, June 7, 2018 – Tata Consultancy Services, (TCS), (BSE: 532540, NSE: TCS) a leading global IT services, consulting and business solutions organization, and Discovery Education, the leading provider of digital education content and professional development for K-12 classrooms, announced the launch of their Ignite My Future in School initiative in partnership with Cornell Tech. Through this program, New York City teachers will receive professional development, educational resources and year-round support to integrate computational thinking into core subjects such as math, sciences, arts, and social studies. In turn, students will learn foundational skills for 21st century careers – across industries – through this pioneering approach. The newly inaugurated Tata Innovation Center at Cornell Tech will host more than 100 educators from New York City today, beginning with three school districts in Manhattan, Brooklyn and Queens. Local teachers will have the chance to apply computational thinking during the Day of Discovery, participating in hands-on activities while accessing lesson plans and classroom resources. The Park Slope Education Complex at MS88 in Brooklyn will serve as the program’s anchor school for this potential citywide initiative encouraging career readiness while empowering students for 21st century careers. Computational thinking provides a solid foundation in all subjects especially computer science, opening up future opportunities with innovative digital technologies like Artificial Intelligence (AI), Blockchain and Cybersecurity. By neatly embedding curriculums and consistently reinforcing critical thinking, Ignite My Future in School hopes to bridge the talent gap and develop relevant skills for the 21st century. These select schools have the unique opportunity of learning and applying computational thinking through an annual free day of professional development for educators and community night for guardians. 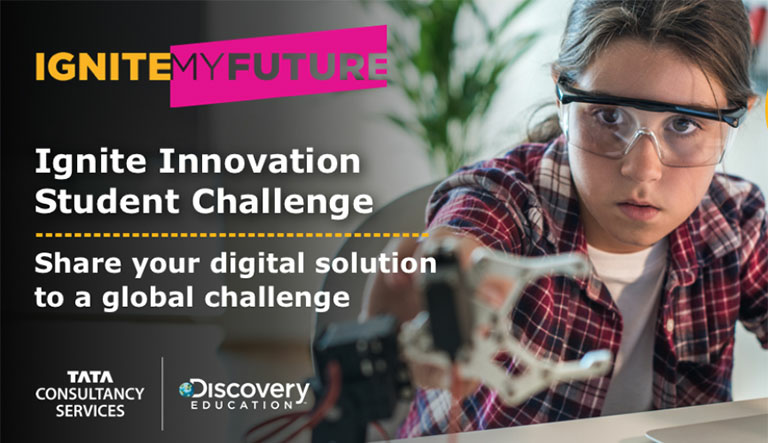 Additionally, TCS and Discovery Education have launched the digital platform, IgniteMyFutureInSchool.org to provide teachers nationwide with an exclusive, cost-free, virtual professional development experience that includes lesson plans, curriculum resources, eLearning courses, and webinars. These resources are aligned to national standards, as well as the recently launched K-12 Computer Science Framework. On a National level, Ignite My Future in School has a goal of engaging 20,000 teachers and one million U.S. students by 2021. As a first step towards this objective, TCS and Discovery Education partnered with U.S. school systems in California, Colorado, Georgia, Michigan, New York, North Carolina, Pennsylvania, Texas, and Wisconsin as early adopters of this transdisciplinary approach. Since September 2017, the program has engaged over 3,300 educators impacting more than 185,000 students. In addition, educators from all 50 states and Washington D.C. have downloaded the lesson plans and modules available on IgniteMyFutureInSchool.org. A part of the Tata group, India’s largest multinational business group, TCS has over 394,000 of the world’s best-trained consultants in 46 countries. The company generated consolidated revenues of US $ 19.09 billion for year ended March 31, 2018 and is listed on the BSE (formerly Bombay Stock Exchange) and the NSE (National Stock Exchange) in India. TCS’ proactive stance on climate change and award winning work with communities across the world have earned it a place in leading sustainability indices such as the Dow Jones Sustainability Index (DJSI), MSCI Global Sustainability Index and the FTSE4Good Emerging Index. For more information, visit us at www.tcs.com.